Sometimes I make something and I just know I have to tell you about it right away. I need you to know how great it is, I need to tell you now. Sometimes I make something, and I tinker around with it. I change things up, and months after the first time I decide it’s okay to write about it. It’s deserving. But sometimes, and this is true often more of cooking than baking, that I make something, and it seems so obvious, so easy it would seem almost insulting to you to give it a recipe and put it up here. It’s something that I make so often that I assume everyone does. That it’s just normal and simple and not worthy of the formality of a recipe and a blog post. 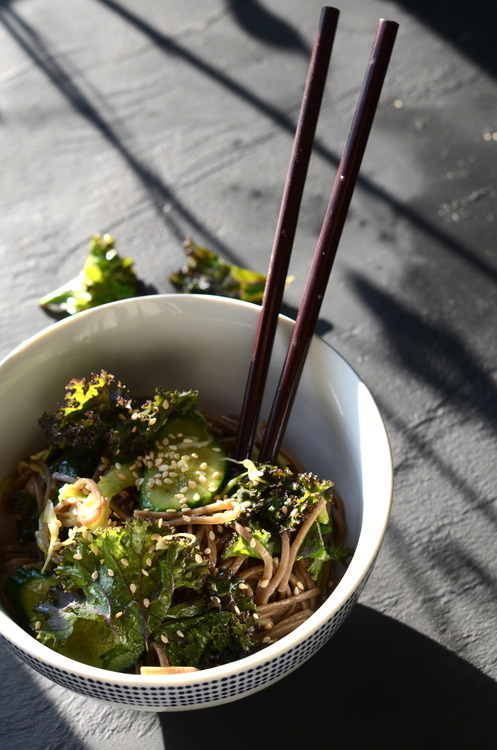 But then I realize that everyone cooks different things at home, and something like this soba noodle salad, which I am making variations on almost weekly, might be worth sharing. 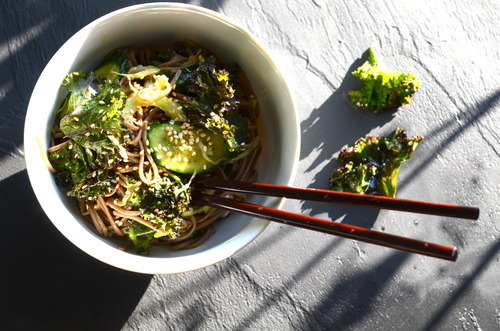 Soba noodles are a staple in my house. I make a big bowl and they last a few days, sometimes serving with steak or some fish, but just as often eating it straight up. It’s a quick lunch or dinner, and it feels good when you eat it. I find myself craving it in the summer months, it’s light and cold and filled with things that my body needs. So I hope that you look at this not just as a recipe, but as a starting point, mix it up, add in things that you have in your fridge, make it spicier, or lime-ier. 1/2 bunch Kale, torn into small pieces off the center stem. 4 Green Onions, thinly sliced on a bias. Cook the soba to the package instructions. Drain and rinse with cold water, stirring until the noodles cool. If you don’t stir, they won’t cool down properly. Meanwhile, mix together the soy, lime, siracha, and sesame oil. Check for seasoning, adding more of whatever you need until it’s perfect. Mix sauce with the noodles then mix in the veggies. Serve and sprinkle with the sesame seeds.